Expert dietitians share their top 10 strategies for shedding unwanted pounds during this festive season. Short bowel syndrome is a complex condition affecting the gastrointestinal tract. Learn more about its pathophysiology and treatment and management strategies to improve patient care. 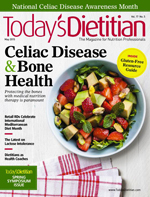 A deeper understanding of the impact of celiac disease and the gluten-free diet on mental health and quality of life can help dietitians improve counseling and dietary compliance. Two brilliant, award-winning teenagers are improving the health and wellness of people in their communities with a focus on nutrition. This continuing education course explores obesity's far reach and ill effects in lesser-described conditions. Today's Dietitian reviews the history and folklore of this humble fall fruit, and provides a variety of recipes clients can enjoy for the holiday season. There are differences in their taste and nutritional profiles. Know what the differences are so you can better educate clients. Nutritious, convenient, and cost-effective, frozen produce can help add more fruits and vegetables to clients' plates. Learn about the latest FDA-approved drugs for people with diabetes and strategies on how to counsel them more effectively. These 10 proven tips can help dietitians plan successful nutrition store tours that can boost retail business and improve community health. This continuing education course reviews the evidence regarding probiotic consumption through diet and drugs in the prevention and treatment of C diff in the adult population. A well-planned vegetarian or vegan diet can be healthful for people of all ages. 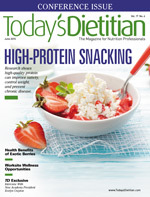 Today's Dietitian offers tips on how you can help clients cover their nutrition bases. Suggest clients look for them in Greek yogurt, beverages, and other products. Encourage clients to enjoy the bounty of fall produce to promote their health and the health of the planet. Forget the expensive digital cameras. Dietitians can take awesome food photos for their blogs, websites, and books with a smartphone. Knowing the rules gives you a professional edge in the cyberspace marketplace. Help patients find evidence-based messages about antioxidants, weight loss, soy, and cancer risk. In this continuing education course, the third in a three-part series, RDs will learn how to develop well-aligned lesson plans that teach class participants demonstrable skills, and create standards from which goals can be identified. 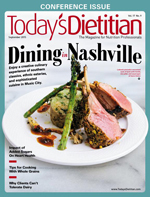 From Southern classics to ethnic eateries to sophisticated, award-winning cuisine, attendees of the Academy of Nutrition and Dietetics' Food & Nutrition Conference & Expo® will be pleasantly surprised with the Music City's dining scene. Recent research shows added sugars can contribute to cardiovascular disease risk and increased mortality. Studies suggest dietary patterns may lead to an increased risk of dense breast tissue, a possible risk factor for breast cancer. Learn about the three main reasons dairy foods are problematic for many patients and tips on how for helping them live symptom free. Because malnutrition screening remains unstandardized for hospital discharge, dietitians must recognize malnutrition diagnostic criteria and make appropriate recommendations to ensure proper nutrition following inpatient stays. The second in a three-part series, this course explores the different types of learning assessments and the rationale for using them. It presents assessment tools and practical suggestions for how to use them in the health care classroom. Certified diabetes educators recognize the strong link between diabetes and heart disease, and therefore emphasize management of other risk factors that may jeopardize heart health. Dietitians are in the perfect position to work with food banks across the United States to help stamp out hunger once and for all. These surprising sources have unexpected nutrient profiles that make them fantastic additions to a healthful diet. Today's Dietitian speaks with experts about the real definition of processed foods and whether all or some are detrimental to overall health. Bees help produce the rich food supply and contribute billions of dollars annually to the North American economy, but their populations are decreasing. Learn why and what's being done to turn the tide. Learn more about the importance of prior knowledge that learners bring to a classroom setting, how to demonstrate ways to assess prior knowledge, and take that information into account to choose teaching strategies that better apply nutrition information to daily lives. 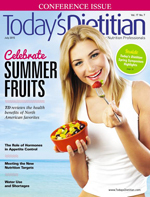 From blueberries and strawberries to peaches and watermelon, Today's Dietitian reviews the health benefits of North American summer fruit favorites. 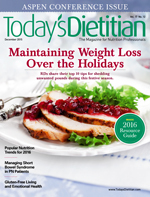 RDs who understand how gut and brain hormones impact eating can help clients navigate the pitfalls encountered in weight control efforts. If you couldn't join us in Las Vegas this past May, read all about the activities everyone enjoyed and view the candid photos that capture the excitement of the spectacular event. School districts across the country are developing strategies to conquer the challenges of K-12 menu planning. 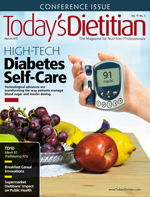 Dietitians play a unique and pivotal role in promoting food and water systems that not only optimize nutrition and health but also advance environmental stewardship. This continuing education course reviews the pathophysiology, symptoms, causes, and treatment for small intestinal bacterial overgrowth (SIBO). In addition, it explores the role dietitians play in identifying SIBO and thus improving nutritional status. Research has found that high-quality protein can improve satiety, help with weight management, and prevent chronic disease. It's a multibillion-dollar business, and career opportunities for dietitians are exploding. Learn all about them and how to break into the industry. Studies show they're chock full of nutrients, but more research is needed to determine their tangible health benefits. Today's Dietitian sits down with the first black president of the Academy of Nutrition and Dietetics, who discusses her incredible journey to becoming an accomplished nutrition professional and her goals for the organization. Learn more about five common nutrition-related health concerns that affect older men and how best to counsel them for prevention. This continuing education course reviews the research on bariatric surgery as a treatment option for type 2 diabetes, including the types of interventions, remission rates, and the mechanisms for diabetes resolution, and outlines practical applications for dietitians. 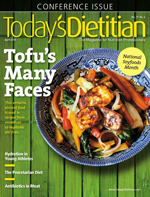 Today's Dietitian congratulates the three winners of our 2015 Share Your Story Essay Contest. Read their engaging stories about why they became dietitians and the journeys they took along the way. Learn how celiac disease impacts bone density and how administering MNT can help reduce fracture risk in patients. Join in the fun as supermarket RDs from across the country offer food samples, stage cooking demos, and educate shoppers to kick off Oldways' International Mediterranean Diet Month. Becoming a certified health coach can enhance your RD credential and boost your effectiveness with clients. What it is, how it's diagnosed, and tips for counseling clients and patients. This continuing education course reviews the epidemiology of endometrial cancer, the increasing incidence of diagnosis, and how nutrition professionals can help reduce survivors' risk of death from comorbid conditions and improve their quality of life. This versatile, ancient food comes in a variety of tastes and textures and is used in recipes ranging from smoothies to vegetable stir-fries. Knowing the guidelines can help RDs educate coaches, youth sports organizations, and parents. Dietitians and meat industry professionals discuss this controversial practice and what could be done to possibly curtail it. TD Q&A: Organic vs Conventional — Which Is Better? 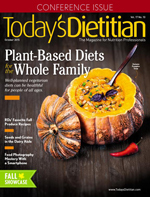 Today's Dietitian speaks with agricultural, nutrition, and toxicology experts about organically grown and conventionally grown foods and their impact on human health and the environment. This continuing education course explores specific lifestyle risk factors associated with erectile dysfunction and whether the condition can be improved by modifying them. Learn about the latest technological advances transforming the way patients manage blood sugar and insulin dosing. 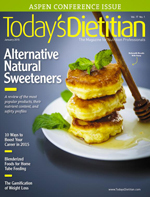 Here's Today's Dietitian's sixth annual showcase of 10 trailblazing RDs who are making a difference. A review of some of the latest trends in breakfast cereals, plus recommendations from dietitians for clients and patients. The increasing numbers and expanding influence of supermarket RDs will have a greater influence on shoppers' health both now and in the years to come. 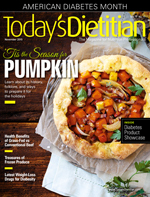 In part two of Today's Dietitian's coverage on corporate relationships in the dietetics world, we focus on how dietitians can build positive, ethical relationships while working in the food industry. This continuing education course reviews the epidemiology of rheumatoid arthritis along with its common treatments and comorbidities in the context of nutrition assessment and management. 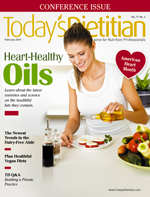 Here's an update on what's trending on store shelves and the latest science on the healthful fats they contain. Consumer demand for plant-based dairy products is on the rise. Learn more about which categories are gaining in popularity and how these options compare nutritionally with their dairy counterparts. Today's Dietitian speaks with successful entrepreneurs to get answers to common questions about what it takes to start a nutrition business. 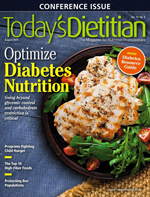 Today's Dietitian reviews the differences between required and voluntary benchmarking programs and offers RDs strategies for implementation to help improve delivery of clinical nutrition services. This continuing education course evaluates the current research on dietary interventions that may affect the risk of developing skin cancer and analyzes the possible mechanisms involved with the disease. Learn more about the most popular products on store shelves and what the science says about their nutrient content and safety profiles. Experts provide 10 proven strategies that will help take you and your business to the next level. Across the country, more RDs are assisting home enteral nutrition consumers with the use of blenderized foods for tube feeding even though not much medical research has been done to support this practice. In part one of this two-part series, Today's Dietitian will tackle the question: How should the dietetics profession navigate corporate sponsorships? We've asked several nutrition experts to weigh in with their feedback surrounding this hot issue.